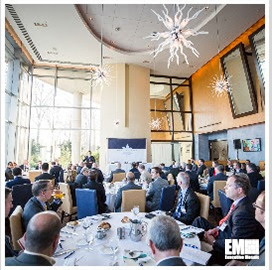 On Thursday, March 28th, GovCon leaders from public and private sectors gathered at the 2941 Restaurant in Falls Church, Va. for the Potomac Officers Club’s 2019 Border Protection Innovations and Technology Forum. Following a thoughtful keynote address from John Sanders, chief operating officer of U.S. Customs and Border Protection, in which he explained the crisis at hand for CBP, an expert panel discussed the challenges facing U.S. borders and the struggles associated with implementing new technology to improve the situation. 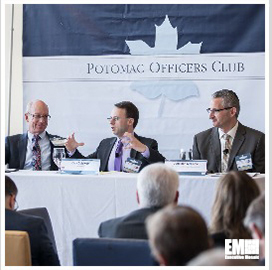 The panel featured Clay Goldwein of CGI Federal, Jonathan McEntee of DHS and Mark Borkowski of CBP. Reginald Brothers, CTO of Peraton, served as moderator for the panel. Clay Goldwein, vice president of Consulting Services for CGI Federal, discussed connectivity and data sharing. He stressed the importance of putting mobile technology and connectivity in the hands of employees working at the border. “They need technology that you can bring on a horse,” he said. He explained that border agents need to understand as much information as possible about the people they encounter to accelerate the process and provide them the technology to address those challenges using a laptop or even a mobile phone. Goldwein also highlighted that law enforcement entities sharing data is another obstacle for border agents. He revealed that there is a lot more information available to agents, but cultural challenges are putting up roadblocks. The general attitude seems to be “I don’t trust you with my data, but I’d love to see your data,” Goldwein said. He cited the recent New Zealand shooting to illustrate how information sharing could have prevented that incident. “If all the entities around the globe, or event just the Five Eyes (U.S., Britain, Canada, Australia and New Zealand) community, were working together to share all the data, that would give the right information to border agents to make the right decisions, prevent future events and expedite our border security process,” Goldwein said. Mark Borkowski leads the new office of acquisition that was created within CBP in June 2016 and serves as the component acquisition executive for the agency. He commented on the challenge of how privacy issues restrict access to data. In data analytics for recruitment and hiring talent, Borkowski stated that he is looking to design the process to target people who are capable of meeting CBP standards. However, he explained that data is available from industry, but it can’t be accessed because of privacy concerns. “I’m not allowed to take any of that data. Industry needs to understand that I have people coming to me to tell me all the data we can collect and use, but I can’t use any of it because of privacy issues. I can ask for you the answers from that data, but we’re at a dead end the minute you try to transmit the data to an IT government system,” Borkowski said. Jonathan McEntee is the acting border, immigration and maritime director for the Department of Homeland Security and Technology Directorate. He discussed the advancement of satellites to provide data to improve the flow of trade for cargo and find potential threats in border security. DHS is looking for industry partners to leverage satellites for search and rescue operations, iceberg monitoring. The department is discovering that it is affordable for to get into satellites. At the ports of entry on U.S. borders. “Any way that we can improve the flow of trade and have that confidence that the image we are looking at can help identify a threat and improve our border security process. It’s not going to be one size fits all, but there are some cases where industry is more efficient than the government and we should leverage that. Satellites is a big one that we’re looking into,” McEntee said. 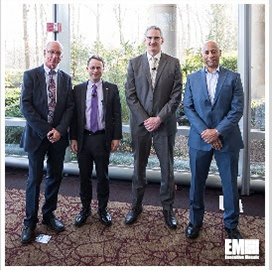 Goldwein, Borkowski and McEntee also discussed the impact of cloud-based systems on border security, how open architecture is being taken for granted and the difficulty of deploying technology into the field. The Potomac Officers Club will host the 2019 Data Management Forum on April 10th. You can reserve your seat for the event right here.